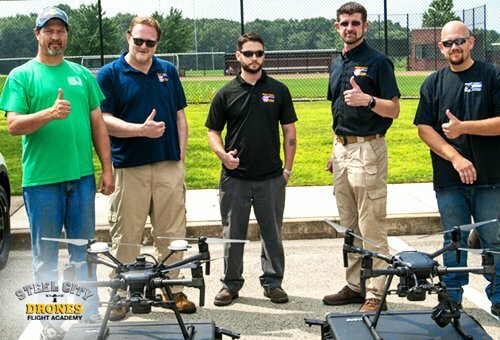 Steel City Drones Flight Academy has traveled coast-to-coast, providing professional hands-on drone training for both Police and Fire departments. 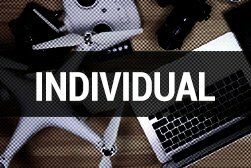 Our drone training experts understand what your team needs and how to get your public service agency flying drones in no time! 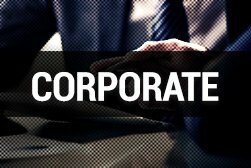 Professional On-Site DRONE TRAINING Anywhere In The United States. 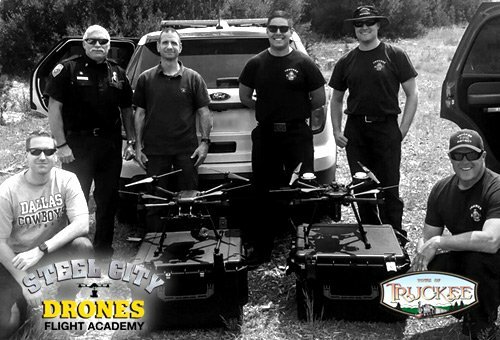 Steel City Drones Flighty Academy will help you confidently incorporate drone technology into your law enforcement and/or fire departments! What benefits do drones offer police and fire departments? Drones provide the ability to easily integrate Thermal cameras, in turn, allowing police to easily and quickly search large areas to locate lost or hiding persons. 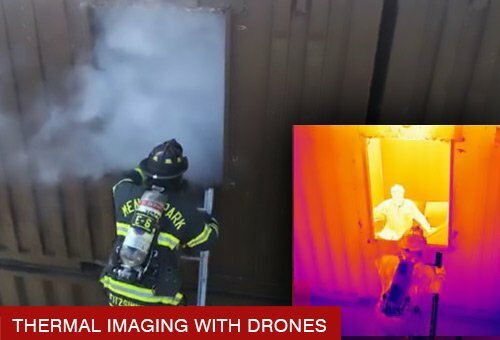 Thermal cameras on drones also allow firefighters to potentially find someone hiding in an upper level of a structure that is on fire. 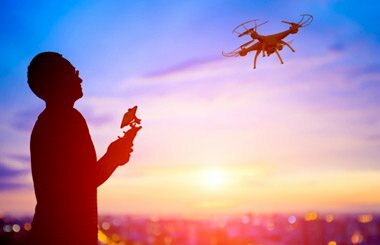 Many drones today are also capable of dropping cell phones, life vests, and/or small packages to people in locations that would, otherwise, be difficult to reach by traditional methods. One huge advantage to using drones for search and rescue is that they can get into smaller areas that helicopters and traditional means cannot. This, in turn, can reduce risks factors that first responder and search teams often deal with during search and rescue missions. 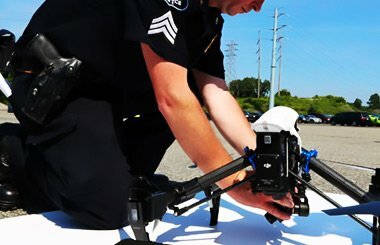 Drones give police departments that ability to create a 3D orthomosaic model. The technology gives them the ability to get very accurate information down to one tenth of a foot or better. The use of drones for 3D reconstruction within Law Enforcement is growing in demand. In fact, many police officers are being trained how to use Pix4D software in conjunction with their drone footage. 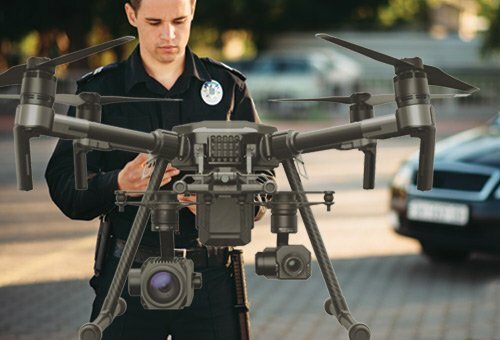 Drones give police departments the ability to easily monitor event crowds and/or suspicious activity from a far (300 to 600 feet away) without alarming people. The advantages using this type of surveillance makes it easy to see why it is a very popular drone application among police departments. 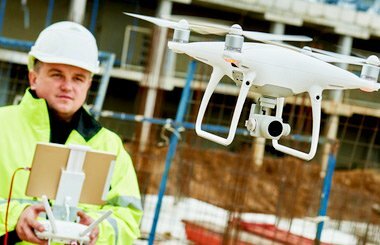 In addition to dispatching drones into hazardous areas for visual evaluation, equipped drones can be used to also test radiation levels, gas leaks and overall air quality. Drones in hazmat situations greatly reduce the high-risk factors associated with sending responders into unknown dangerous areas. 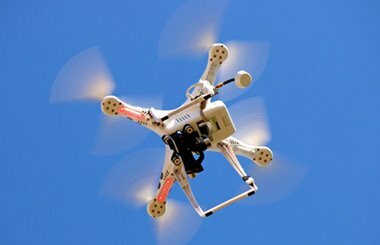 When there is a situation that involves an armed suspect, having the ability to get a visual access, via drones, in areas that could not be done otherwise (or not without great risk), could make a difference between life and death. 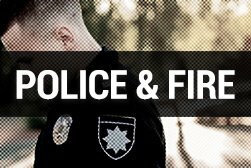 It allows law enforcement to have an advantage, to better evaluate and position themselves to potentially deescalate the situation quicker. Storms can leave a path of destruction that can become very dangerous to navigate and survey. 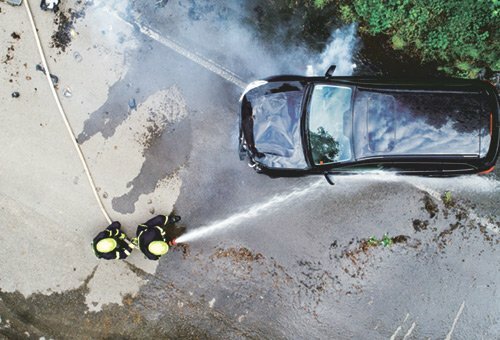 Drones can reduce this danger by allowing first responders to evaluate and travel over dangerous areas and assess situations quicker and safer; allowing for optimal response to better assist high-risk areas and/or people in need. Even without thermal imaging (as mentioned above) using drones allow fire departments to assess fires more safely. 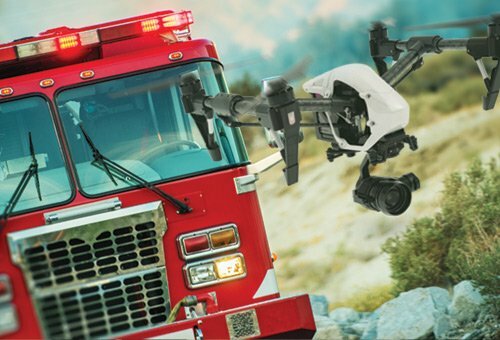 Whether it is a wildfire, a burning house or a building on fire, the use of drones give firefighters the ability to better evaluate the situation and create a combat plan that will be more efficient; all while reducing risk. 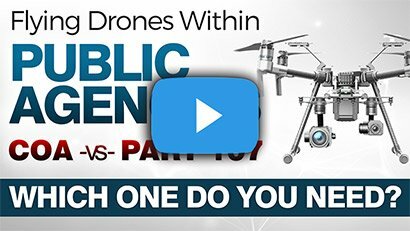 Which Drone is right for my public department? Below is list of drone models typically associated to public safety sectors such as law enforcement and fire fighting departments. Each one includes a short list of highlighted features. For more information and to talk about your specific needs, drop us a line and we’ll be happy to assist. 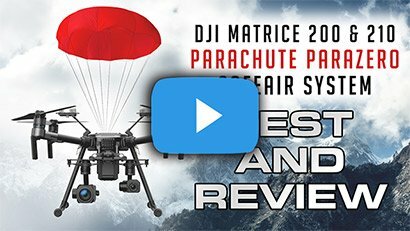 Read our extensive review on the DJI M200 series here: DJI M200 and/or watch our review below . 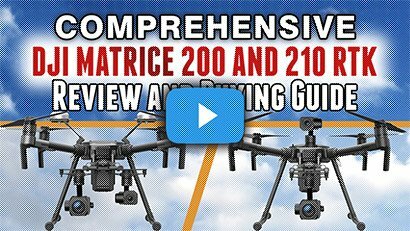 The DJI Matrice 200 and 210’s are predominately the best drones used in police and firefighter departments. Watch our comprehensive review on the DJI M600 below. 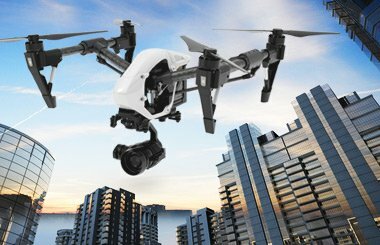 The Phantom 4 Pro V2.0 is a good alternative for police and fire departments that are on tighter budgets. The Downsides are no thermal camera integration, no weather resistance, no wind resistance, and any smaller drone becomes easier to lose a line-of-site from the ground while it in flight. 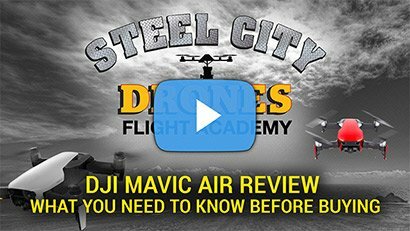 Watch our review on the Mavic Air below . The DJI Mavic series is a good aircraft for secondary applications. Many law enforcement departments call us wanting to know if they can use a Mavic as their primary drone, but we do not recommend it. The Mavic series is not wind resistant, it does not have zoom capability and it cannot fly manually if needed (bad or failed GPS automation). Having said that, because it is very portable, this aircraft “IS” good when police officers want to keep a drone in their patrol car that they can deploy on site very quickly for a an immediate site assessment. WE CAN TAKE YOUR DEPARTMENT TO THE SKY.